Our most powerful self-feeding chipper, this beast devours branches up to 5.75" in diameter. Electric-starting is standard. Available options include a road-towing kit and an extended discharge chute. Lowest Prices Ever on a DR Chipper! Our most powerful dedicated wood chipper, designed for the rigors of continuous wood chipping, hour after hour...year after year. Anything too big for this machine can be sold as firewood! You simply can’t get a more powerful chipper without getting into the hugely expensive industrial realm. Put chips right where you want them. The high discharge on the PRO XL575 model accepts our swivelling, extended discharge chute that turns 180 degrees—allowing you to direct wood chips into a pickup truck, a container, or into the woods. The big opening for branches (19” x 30.5") accepts 5.75” branches with little or no trimming of side branches. Add the optional road tow package and you can easily tow your Chipper on roads at speeds up to 45mph. Please note: If you purchase the optional road tow package with your machine it will be factory installed and the standard pin hitch will not be included. The commercial-grade centrifugal clutch on the PRO XL575 Chipper is similar to those used in well drilling. There is no load on the engine until it reaches 1,600 rpm. If you do manage to find a branch tough enough to slow the engine to 1,600 rpm, the clutch will automatically disengage the engine until it's back up to speed. The legendary power, performance and durability of Briggs & Stratton® engines make them the only ones we use on our DR Chippers. The PRO XL575 Self-Feeding Chipper uses a durable 13.5 HP (21.0 ft-lbs gross torque*) Overhead Valve engine with electric-start. It features a debris management system that protects the engine from whatever you kick up while you’re chipping and shredding. The key to efficient wood chipping is the rotating mass created by the flywheel on which the chipper knife is mounted. The PRO XL575 Self-Feeding model features a 20” diameter flywheel that’s a ⅝” thick and weighs a hefty 62.5 pounds. It spins at 144 mph and takes an amazing 40 “bites” per second! Hopper Opening Size 19" x 30.5"
For what they wanted to cut three trees I purchased the DR Chipper.Now I can use it on my property at my convenience. No rental fees. So far it works excellent. Have used it just a few times , but seems like a very well built and durable machine. Has many good features other chippers I looked at did not have. Electric start at no extra charge was a nice one. Anything I have feed this machine so far , this chipper takes care of. I just received this machine and used it for this first time and it made quick work of everything I threw in, amazing ppwer and efficiency. The two conplaints I do have has to do with moving the machine around my property and the instruction manual. Inwould suggest more substantial off road tire and a wider wheelbase. A chipper is sort of top heavy to begin with, the ridiculous wheels training wheels along with the narrow wheelbase make this machine unstable and very difficult to move around my 40 acre property. I really dont need the road kit sold by DR, i dont need turn signals in the woods,. What people need when clearing brush and trees is ground clearance and stability. The tires are seriously like kids training wheels on a biicycle, really notmuch better. I plan on getting an after market set of wheels and tires and maybe extend the wheelbase. The second issue is the instruction and operating manuals, have the folks at DR actually tried to read them? Its as if they were wriiten by someone who spoke english as a second language and the illustrations were unhelpful and unclear. I would absolutly recommend this chipper to someone based upon how it operates, its a monster! But it could really use a rethink On how how this machine is set up for transport. Its a monster that needs to learn how to walk. Works as advertised, it really is self feeding. Easy assembly. Chipped everything I had cut down. My only complaint was the zerk fittings were not completely threaded in and did not appear to have been greased. We've put about 5 hours on our DR 21.0 chipper since we got it, mostly chipping gnarly Rhododendron up to 4 inches in diameter. So far this machine works great. It makes nice mulch sized chips and will take what you put into it about as fast as anyone would care to feed it. The engine runs smooth and fires up immediately. Upon receipt and unpacking one tire was badly crushed from being tied down to the pallet. After sitting a couple of days it returned to it's normal shape. The only things I could really complain about if I want to be picky is that I think the flywheel could be balanced a bit better and the lack of an hour meter and low oil shut down on the engine. The latter two would make maintenance intervals more exact and protect the engine should it become low on oil while working. The flywheel balance isn't that critical becasue once running up to speed it smooths out but at intermediate speeds or when slowing after the engine is put back to idle it does shake the chute some. Overall, it the short experience we've had, this chipper really works well and I'm glad we opted for the larger unit. Anything larger than this machine will take is firewood and rather than piling up debris or burning it now we have ample mulch. Purchased my chipper thinking I was going to do some weekend clearing up. When it arrived sure did look like a nifty sweet little toy. Short time after receiving the chipper Hurricane Michael passed through Cuthbert GA taking down many a tree and a whole lot of branches. This chipper was a god sent third hand. It proved itself to be more than a toy. A truly professional workhorse. Been working the property non stop and it makes me proud to display my DR everyday. It has already made the investment worth while. Every time I placed a larger piece in, I taught that was the piece that would make the DR meet its’ match. The DR just kept on chewing and spitting out chip after chip after chip. Thanks for the great piece of equipment. A true professional. Highly recommended.for anyone, even professional landscapers . I love this Machine it’s a beast made a quick job of clean up. The chipper works great. Self feeding is a great feature. Unit has lots of power and chipped a 4.5 dry pine branch without difficulty. The battery positive post could have used a flat and lock washer as was on the negative post. That was an easy fix. Built to do the job! As expected, after using all DR products that I own, this Chipper meets all of my requirements. I just retired and returned to my ranch which has overgrown over the 18 years I was away. Everything became overgrown and needed to be cleared along with stumps removed. I tried using a friend's chipper and only managed to burn out the fly wheel after only a few days. So far My DR chipper is going through my piles of brush like butter. I would recommend getting the extra blade along with the road tow rather than the yard tow that comes with the device I have the 21.0 Self-feeding, Electric Start model. I haven't had any issues with the yard tow but it just seems a bit weak and I do wonder how well that will stand up over time. If you have a lot of cleaning up to do, the DR Wood Chipper is the way to go. This machine eats wood like a dinosaur. 1 2 3 job is done.. The chipper has worked flawlessly. I am pleased with purchasing the largest throat chipper. I still need to trim some angled branches on branches before getting them into the chipper. With the 21 engine I haven’t noticed even a slowdown in revs. Green branches are chopped up 2-3 times faster than dry branches. I have run about three gas tanks through the chipper. Everything seems to work find except the tongue is too short should be at least 1-2 feet longer very hard to hook up to a 4 wheeler especially for a girl because it is quite heavy be nice if it had a roller on the bottom stand to make it easier. This is our first season with the DR C/S. We had previously used a Troybilt yard model. The self feeding feature is making the task of turning brush into bedding go more than twice as fast. The Electric Start helps minimize the work time as well. Chipper/shredder arrived well packaged and with a little wrench and screwdriver time ready to go. We calculate that this will pay for itself a in few years by calculating the hours it will save and using our materials generated on our property. After putting it together and adjusting the chipper knife to get the 1/16 inch clearance, put in fuel and checked the oil. Started with no problem, but flywheel seemed to be bumping something. Turns out, the flywheel was out of line with the housing. Removed the pulley cover and saw that the flywheel pulley was not in line with the with the motor pulley. Removed belts, loosened bearing mounts on both side, and moved it as much a the bolt holes would allow. Still a bit out of line, but at least the flywheel isn't rubbing the housing now. May still have to take it in to a service center. so far, chips good around the property, has good power. the set up of non highway tow bar could have been a lot easier- instructions poor. I also would have liked it to include built in hour meter. I have level property but with ruts- i have to tow VERY slow- the center of gravity is high- would be nice if wheels were further apart. For the price should have included extended discharge chute. I purchased one of these machines because I need a wood chipper that is less capable than a full sized professional one and yet greater than those found in box stores. Mine has the road tow package and the extended discharge chute. The first problem I discovered is that all the needed nuts and bolts for assembly were not included in the hardware package. It took several trips to my local hardware store to solve this problem, which was annoying, but not fatal. Then I discovered that the self-feed hopper could not be attached properly because the "shipping bolt" that goes through the scroll assembly isn't long enough to accommodate the thickness of the hopper assembly and the required washer. There aren't enough threads to secure the locknut. So, this bolt needs to be replaced with one a bit longer in order to mount the feed hopper. My order included the extended discharge chute, and while I found that the standard short chute can be mounted, it is physically impossible to mount the extended discharge chute. The mounting holes are in the wrong place. Between the bolts that hold the scroll assembly together and the top of the flange where the chute is mounted the clearance is 5/16 of an inch. However, the holes in the extended discharge chute are 7/16 of an inch from the bottom edge of its mounting flange, a difference of 1/8 inch. It's not possible to mount the chute without removing the scroll bolts, which would not be safe or mechanically adequate. I can fix the problem by grinding away part of the chute mounting flanges to clear the scroll bolt heads and their nuts, but the holes should have been placed in the correct place to begin with. A flange that was 1/8 inch shorter would also clear the scroll bolts. So, I cannot rate this machine's performance as yet, because I have not yet been able to assemble it. I still need to make another trip to the hardware store for more parts and then do some machine shop work to make the discharge chute parts fit. The best rating I can currently provide is a neutral one, neither good nor bad. When I get this machine in operation, assuming I can finally do that, I'll give another comment on its performance. Right now, I am not impressed. Bought the 16.5 from my neighbor for less than have the cost of a new model. Have run some really large vine maple and alder through it. Needs a knife kit now and the solenoid went bad but I could arc it across to start it no problem. Wish it had the extended chute but like I said, I'm second owner and still couldn't be happier. Be sure to drain your gas tank over the winter it'll gum up if you don't. Love the machine. Excellent machine for creating mulch. Response from DR SupportHello Eric, Thank you for contacting us. We're sorry to hear that you're experiencing these problems with your new Wood Chipper. We see that you've already spoken with a Technician today and replacement parts are on order for you. Issues like this are clearly out of the norm and covered under the standard warranty. Please let us know if you continue to have problems, we want you to be satisfied with your machine. Thank you again for contacting us. Have only tried the Chipper one time so far. Worked great. chips great. Wish it were more steady to pull behind a vehicle while on the job. Wheels need to be further apart for stability. Had problem with falling palm fronds falling on my house and drive way. After seeing DR chipper commercial I decided to get top of the line DR 21.0 chipper with Extended Discharge Chute. Very satisfied, excellent machine, saves time, starts easy, works great. Get the better engine if you can, that is my motto. The Extended Discharge Chute will save you time by ejecting right into collection bin. Good job DR. I bought this chipper a year ago last December. I had the special 12 month trial. I figured I would have the full spring-summer-fall time frame to see if I could justify the expense. To make a long story short, I decided to keep it after about 2 hours of use. When you have piles of brush everywhere, the last thing you want is to have a chipper that struggles or can't keep up for one reason or another. Breaking down brush piles is hard work. This chipper has been flawless in destroying brush. I got the chute extender and it works great for me. I just aim it at the back of the pick-up and dump it in my ever growing woodchip pile at the edge of a field. If you have a bunch of trees, you will never not need this machine! Buy with confidence. I used it for about two hours on different types of wood and diameters. It powers through 3" scrub oak which is very hard and has twisted grain. It handles both long pieces and short ones. Sometimes the short pieces bang loose in the chamber. But throwing in a second piece with it holds it in place to chop it. It starts easily with electric start or pull cord. It pulls comfortably behind my garden tractor up and down slopes to work site, so I don't have to lug branches far. I modified the standard output chute with my own extension to blow the chips into a 40 gallon garbage can which I roll to dump site with hand truck. I bought the clock monitor for measuring run time which was easy to install and works well. If blade life is truly 40 hours I will be very happy. It does an incredible job for its size. Several hours of use and no problems. The electric start worth every penny. It self feeds perfectly allowing me to continuously supply it as it chips. hoping for longevity. Love the chipper! I was dismayed to find that it was shipped on a pallet that more than 48" wide; it won't slide into a pickup bed. Barely fit with tailgate extended and well tied down for the trip home. Also, someone had disconnectecd the starter connection at the solenoid, which is in a very difficult location. No wiring diagram was included, which made the troubleshooting harder than it needed to be. Once that was all worked out, I am very pleased with the performance and the use for which I intended it. I'm mostly handling trimmings, which it happily chews up. (I keep the bigger branches for firewood, so don't really use the large chipping capacity.) I was concerned that maybe I needed the shredder model, but this does everything I wanted. I received the DR C600-CHP 21.0 ft/lb chipper via truck with a lift gate. The chipper was crated and attacked to a pallet. (1st note: Bring your hammer to unpack the chipper.) When the truck driver and I started to roll the chipper off the pallet and onto the lift gate, we had some difficulty "rolling" it across the slatted pallet as the tires were pancake flat! (2nd note: Bring an air compressor to air up the tires prior to moving.) Even after unpacking and lowering the chipper to the ground, it proved difficult to "roll" the chipper up the driveway to the air compressor. After reading the instructions and getting the machine set up, I started up the chipper and went to work. The machine worked as advertised and better than I expected. I fed a few branches into the hopper that were near 5-inch diameter. Very impressive! The instructions recommend that large branches be no longer than 5 feet, however, that length pushes the limits of the chipper with large branches in the 3- to 5-inch diameter. I cut all these larger branches to about 1-foot lengths. The chipper thanked me for this by not loading down the flywheel as badly. After about 34 hours of crunch time, the blade needed changing. I installed the new blade according to instructions, using the gauge provided for setting the cutting gap between the blade and the wear plate. All did not go as planned, however. It is necessary to remove the feed hopper in order to change the blade... and when I tried to remove the nut from the top, left threaded stud that secures the hopper, the threaded stud twisted off with the nut still attached. In spite of that small setback, I started up the machine and went to work again. I used a chain saw, cutting all the branches into suitable lengths, while my wife fed them into the feed hopper. As I was cutting, my wife got my attention to tell me that the chipper was no longer chomping on the wood being fed into it. I checked to see what the problem was and readily noticed smoke coming from the centrifugal clutch. I immediately shut the chipper off (via the key) to inspect the machine. There was a 3-inch branch from a mimosa tree stuck in the hopper against the flywheel that bound up the flywheel until it completely stopped. That caused the v-belts, in turn, to stop the clutch as well... all-the-while the horizontal shaft of the engine continued to run at full throttle. The result was that the clutch was completely ruined from EXCESSIVE heat from the resulting friction. That was an expensive lesson to learn! I ordered another clutch from DR Power Equipment on my dime since the failure was not caused by any manufacturing defect, but by improper operation. Lesson learned: Be sure to instruct ANYONE who may be feeding this chipper its lunch how to safely and correctly operate the machine. Also, be sure that the person knows how to shut down the machine as quickly as possible should he/she notice any irregularity with its operation. Aside from these shaky beginnings, I really do like this machine and I do recommend it to others. It is a workhorse! Works very well, have a little issue with clogging and have had to take the chute off several times to clear jams and free the flywheel. But under heavy use it has performed very well would buy it again if the day ever comes to need one. works fine,short chute was a little hard to fit. We've been clearing a lot of deadfall timber from our property with our new chipper and find it to be everything we hoped for. Most of the wood is maple, aspen, balsam and pine. It handles all species up to the 5.75" capacity as advertised and we're using the chips to line our paths and trails. It's well worth the $ spent. Great product - needs clean out! This chipper is powerful and works well. The only problem I found with the product was that at one point the blade got bound up with wood chips that were stuck in the bottom of the blade housing. Having a way to clean out the debris from the bottom would be helpful. Over all a great product though. I've used my chipper a few times now for a total of 6 hours. Although it's advertised to chip up to a 5.75" branch, it is best suited for 4 inch and under. It will chip a 5 inch branch, but the motor pulls down after a couple feet and continues to pull down. Pulling the branch up to allow the motor to recover will let you chip the branch, but I think it works the system too hard so I try to limit the size to around 4 inches instead of 5. Other than the larger size branches of 5 inches or more, it's a tree eating machine. I am more than happy with my chipper. Before i received it i was doubtful it would do the job i needed to do. It exceeded my expectations twofold. This chipper is a beast. 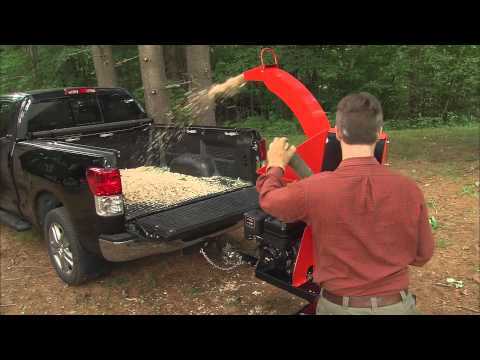 It chews up logs and branches without skipping a beat. Great value! This chipper works really great on large and small branches. Small get chipped as fast as you drop them in by the handfuls and they all self feed. The only problem I've found is If there are small branches sticking out they'll hang up, but you can take a thicker branch and push them down. It also does really well on bark as long as you fold or cut it smaller than 51/2" wide. After using a decent big box store chipper for the last 15yrs, this DR Chipper is a dream. I can't believe how well this thing worked. I chipped a brush pile up in 30 minutes that would have taken me 3 hours to do with my old chipper. I couldn't be happier or more impressed. All I can say is WOW. I wanted a chipper that would take anything I threw at it. This thing is a wood eating beast!!! Those chippers you buy in the big box stores have to be babied. I throw in two or three small limbs at a time. Even up to a 5'' limb. Had a huge pile of tree trimming on the ground waiting for this bad boy. Gone in no time. Love this chipper. Only used 6 hr so far but does everything they claim. Like most quality equipment it might be more $ up front but will be much cheaper in the long run. the only negative i have is the size off opening at the bottom of the chute. i have a lot of oak and with the twist and wyes in material it is hard to feed into the opening. the straight pieces do great. i love it. We own a 10 acre parcel of mountain property with pines and quaking aspen trees all over it. Needless to say, we generate a lot of slashings (tree branches). You chipper has made it a lot easier to dispose of the piles of limbs and at the same time giving us wood chips to keep the moisture in the soil. So far it has handled limbs up to 5" in diameter with little more than a sigh. I am certain that we will be using it for many years to come. I will certainly consider other equipment made by DR.
Have cleared 2 brush piles and the DR did great. Easy to assemble, easy to start. Can be a little tricky to roll around and store. best chipper in it class. This chipper does everything that dr said it would do . Heavy built. I think it last me Along time. This unit works great. My greatest concern was regarding the queen palm branches which I have many of. The fibrous nature was a problem for my previous chipper shredder. This unit does it easily as long as the branches are green not dry brown. Fine unit. I'm happy. Worth the money. I love it! So far it has lived up to my expectations. Really like it. Just ate up all those branches. Was chipping bull pine, would get clogged. (When the green pine needles go through. ) we like it, turns a big tree into a small pile of chips. Happy happy! Love it! It makes quick work of brush I have/had around the house and fence. Wish I would have gotten one sooner. No shocker here....Another great product from DR Power. I purchased the Chipper and the Versa Trailer and the 2 together are easily towed by my 4-wheeler and makes it extremely easy to cleanup tree trimmings. I use to have to cut, drag, and burn. Now I can cut and chip right in place and have mulch when I'm done. Thanks again for a great product! I live in New Mexico near the El Paso area and I have about 100 Pecan trees. This area is experiencing the worst drought in over 40-years, which has caused the county to; only allow one irrigation for this year. The shortage of water obviously is not good for the trees causing many dead branches on the trees. This year, I cut and loaded well over 1000 pounds of dead branches on a 20-foot trailer for the local dump, which could have been recycled on my land in the form of mulch. In short, I received the 30.00 Pro-XL a few weeks ago and have only put 1.3 hours on the machine, which is not much, but I watch it gobbled up 6-foot 3-inch branches with little effort. I followed the instructions and assembly of the chipper was easy, put gas and oil in the engine as prescribed, and the engine started instantly. As I put the first branch in the chipper, I was very surprised how fast it chewed through the material. In reality most likely, I will never test the machine?s full capacity of 5.5 inches. However, I am very satisfied with the larger capacity and glad that I decided to invest in the larger machine. When ordering the 30.00 Pro-XL, I decided not to order the extended shoot or the towing package, based on my needs and found that the operation of the machine worked better than I expected without the additional hardware. The bottom line, I found the 30.00 Pro-XL to be well-built, the engine a work of art, and I would recommend it to a friend. Really does zip through 51/2 inch thick "branches"
Prompt shipping.. don't buy off season to get the special pricing. There's always a sale! For my "discount" I lost the free trial period with the chipper packed away till the snow melted... checking back, there were other offers! Electric start, big branch chipping is TOTALLY awesome! Tree top branches are too much work to chip.. smaller main trunk w/ side branches don't self feed and it's work to get them through. Buy an extra blade! To maintain top performance, needed to change blades about every 10 hrs. of operation. If you get the big chipper, get the extended chute. A bit of a pain to turn and lock in place, but I wouldn't want to be without it. This chipper is for big jobs! Go smaller if your needs are for smaller diameter branches. Top of the line "small chipper"
I got this used as I couldn't pass it up. I use it in my landscape business and it is a big help when I got brush to chip. Its small enough to easily transport and store but big enough to chip any type of wood. The 18hp Briggs always starts easily and has plenty of power to chip up any wood that is placed in the hopper. A big selling point to me is the road tow kit and the optional extended discharge chute. It can load my truck as I chip. It also has a bigger opening to reduce clogging of the hopper. For occasional light commercial chipping this works great! The 30 Pro-XL has performed as advertised. Somewhere about 6 hours the blade started to get dull. Have ordered a second blade and performance is back to new. I would recommend any owner of the 30 Pro to have 2 spare blades. If you are in the middle of a project and the installed blade starts to goes south on you, the extra blade will save the day. Blade change out was about 45min's. save a fortune on mulch! This product is a real work horse. We have used this chipper for all size branches up to four inches in diameter and it performs beautifully. I have been pleased most of the time with this machine. I have been having trouble with the auto feed. I do not know how much I should be pushing the limbs into the chute. Very seldom does the branches go down by themselves.I don't know if I'm doing something wrong. Maybe you could give me some good ideas on what I should be doing. I will br looking forward to your responce and I do like my new chipper. Not everything is bad,just the auto feed. Thanks for your help. Response from DR SupportThanks for leaving a review of the Rapid Feed 30 Chipper. The Chipper doesn’t have an auto feed mechanism, it’s gravity fed. Once through the base of the hopper, the knife will start pulling the branch through. Are you trimming the branches? It could be that the offshoots are wider than the approximately 7” x 7” opening at the base of the hopper and they are providing resistance? Also, the knife may be starting to get dull. Make sure it has a sharp edge. I use the chipper on cedar trees in our hilly 80 acre pasture tows real easy with 4- wheeler. Leaves small piles instead of huge brush pills. This is an awesome machine. This is a awesome machine that can make a pile of brush disappear in no time flat. I don't have many hours on the machine but the work that has been done with it is unbeleivable. Very easy to start and has alot of power.It is nice to get rid of all the branches and small trees with out having to worry about burning and the added bonus all the mulch that you get. I tshould have rented a larger chipper to clean up the brush to avoid maintance etc. It would have been less expensive. Though good, the chipper opening is too small for the things I have to chip. Also the shoot gets jammed with limbs etc at times. Though I trust the quality ( and your customer service is very helpful!!! ), again I should have rented a larger model or just hired a company for a day to mulch/chip limbs small trees on the property. One of my most favorite tools. Excellent for cleaning up limbs and bushes in the yard. Chips up to a mulch, which can be used in other areas of the yard. Everybody needs one of these. I owned a Tomahawk chipper/schreder that was 15 years old, 3 inch capacity and difficult/hard to use. I am an older person and need something that would not put my heart rate into overdrive. This unit fits the job I had perfectly and I now have another problem, what to do with the mountains of chips. Love it! The chipper is a great alternative to burning. We have used it while thinning over ten acres of forest land without any problems. The chips are great for landscaping and with the extended discharge chute you can scatter the chips, pile them or blow them into the back of the pickup. Anything too big for this chipper to handle is firewood. I have used this unit for 8 yrs with almost no problems, carb on engine had to be cleaned because of gas. I chip both hardwoods and softwoods up to 41/2". The larger pieces chip better than the small ones. I added 12" to the outside of the feed hopper, and the unit works much better for small stuff, especially when you feed multiples pieces at one time. Easy to hook up and pull with my rtv to the site. This is really a rugged unit. Doe's it come with the extended chute how fast can you tow it on the highway? Will it chip a 5.5 inch oak tree 20' in length with it's branches on . I want to no if I get it started can I walk away from it and it will feed it's self as good as a commercial one. I want to be able to clear 10 acres of pine , oak. And cedar . I don't except it to be as good as a commercial one . But if you say it will take 5.5 " logs. Then that's what I expect it to do . And self feed! Thank you. Benny! A.The extended chute is optional and will need to be purchased separately. With the road towing kit, we advise going no faster then 40-45 mph depending on the road. The 30 Pro-XL Chipper is capable of chipping branches up to 5.5", with our without side branches. Being that it is gravity fed, if you insert a branch into the hopper, it will feed itself. The Rapid-Feed Chippers are very powerful machines and can handle hard or soft woods. It is also very capable of being worked all day and clearing large amounts. They come standard with a two year warranty and give the option of extending to a full five years. We also offer a 6 month trial period. If for whatever reason you weren't satisfied with the Chipper, you can return it back to us for a refund, less shipping within the trial period. Thank you for your inquiry. 75 people found this answer helpful. Q.What are the dimensions of the shipping cartons(s)/pallet? A.The Chipper will hold up fine. You will need to keep an eye on the knife to see how it is wearing and sharpen/replace accordingly. Q.Will a person be able to mulch leaves with this as well as branches? A.The Rapid-Fire Chippers are designed to handle any wood that can fit down the hopper opening (within the maximum diameter ratings) and make rigid contact with the knife-edge. Material such as dry leaves, vines, grass clippings, straw and other garden waste may be difficult to feed down the hopper and may not adequately chip or discharge. For this type of material we suggest one of our Chipper/Shredders. Chipper/Shredders are multi-purpose machines which have separate chambers for chipping branches with a chipper knife and for shredding smaller material with free-swinging reversible hammers that pulverize and convert loose matter into mulch or into small shreds that will compost rapidly. Q.Your vids all show single poles being chipped. I'm ready to order this item and some accessories, but I'm concerned about the ash tree branches that I want to chip (and others similar to them) where there are little clusters of side branches. Will this machine draw them into the chipper without hanging up? A.If you cut the material to be chipped into manageable lengths and do not overload the chipper hopper with limbs that have clusters of side branches, the chipper will accept these limbs. Green material will process quicker and easier than dry material and the Chipper will self-feed the wood once it contacts the knife edge. Rotating the branch as you feed it into the machine will improve chipping performance. Also, your operator experience will teach you how different types of wood will chip and how fast you can process them. Q.What is the total weight of this machine? A.Thank you for your inquiry. Dimensions are: 43"W x 58"H x 56"L (w/ hitch up) - 70" (w/ hitch down) and 491 lbs I hope this answers your question. If you'd like to order one please call us at 800-736-9637. Q.If you order the road tow package do you still receive the other wheel setup for lawn tractor towing? A.The chipper will arrive with the standard hitch, wheels, and axle. If the road tow kit is ordered it is installed by the customer so you would have both standard and road tow components. Q.what engine is the 30.0 pro-xl equipped with? what accessories are available for that model? A.Our 30.00 Pro-XL Rapid Feed Chipper uses a Briggs & Stratton electric starting engine. The accessories we offer for this model is the extended discharge chute, our road-tow kit (available for the Pro and Pro-XL models) spare chipper knives, a maintenance meter and the maintenance kit. We also have an accessories kit which includes the extended chute and chipper knife for a 10% savings. Here is a link to the accessories, http://www.drpower.com/prdSell.aspx?Name=cpr-sp-pro-xl Thank you for your questions. A.Our DR Chippers operate by a flywheel mounted knife. There is a specific gap width between the knife and a part called a wear plate. Adjustment outside of these parameters will decrease the performance of the chipper. Chippers themselves do not have a hammermill or discharge screen as they create chips from a single cut of the knife. Our Chipper/Shredders however are equipped with a hammermill and various screens with altering discharge hole dimensions are available. If you have more questions give our sales department a call at 1-(888) 550-0062. A.Here you go, http://ow.ly/i/YJqq This is the CP3 Pro XL without the Road Tow package. Q.I have mostly oak and maple on my property, some pine. Approximately how many hours of chipping should I expect before needing to change knife? A.Our knives are capable of chipping for about 20 hours before they need sharpening. They can be professionally sharpened for another approximate 20 hours of use. These are very tough blades that can easily chip through any hard or soft woods. Q.I just picked up my 30.00 Pro-XL. Question: after engine start, and then you throttle up the engine and the fly-wheel engages, what is the expected noise level? Seems very loud even before you start putting in branches etc. I have had wood chippers in the past and have not heard this level of noise prior to putting in the branches?? A.The Pro-XL Chipper is one of our loudest machines. It measured at just over 110 decibels during our testing. This is why it's very important to wear hearing protection when using any piece of equipment with a small engine powering it. A.Thank you for your inquiry. When you order the road towable kit the hitch comes with a 2" ball receiver. I hope that this answers your question. If you'd like to order this item, please call us at 800-376-9637 or place your item in the cart online. Q.Can this chipper be moved by hand, or do you need a tractor or ATV to move it? The DR 30.00 Pro XL Chipper is a large machine weighing 491 lbs. We do recommend that you tow it with a tractor or ATV. Q.I am not clear whether the chipper comes with 1. hitch and wheels (off road), 2. a battery for the electric start, 3. when I order the extended chute, will it be delivered at the same time and 4. what would be the nearest delivery point for free delivery???? Q.Does material have to be dry to chip? We can't always choose when to visit our property and due to recent rain/snow things are likely to be drenched next time we are there. Can the chipper still work or will it clog? A.Thank you for your inquiry. The Rapid Feed Chipper line will process green (wet) or dry wood without clogging. We offer a money back return policy if you experience otherwise. I hope this answers your question. We have alot of pine trees on property. Some down some still standing dead. The pine beetles have done their damage to say the least. How well can we expect the chipper to chip up dried branches from these trees. Q.What discharge chute comes with this?The picture shows the "optional extended discharge chute". A.The DR Rapid-Feed Chippers come standard with the low profile chute. Q.Can I get one with manual start? A.Our 21.0 Chipper is only available as an electric start. There is, however, a manual back up on it. So if the battery were to die, you can still pull start it. Q.axle width and chipper weight? A.The 30.00 Pro XL Chipper weighs 491lbs. The Wheelbase dimensions are 42.5" (Non-Road Tow) & 44.75" (Road Tow). Q.Can you ship outside the U.S.?I am moving to Belize C.A. A.We're sorry but that is something that we don't test for. There are too many variables between Log Size, Moisture Content & Type of Wood. Please call our Sales Dept at 888-550-0062 and they can talk with you about your needs and determine if our Chipper is appropriate for your needs. Q.I want to take advantage of this sale but am not ready to have it sent until i can use it in the Spring Is there a way to delay the delivery date? We can hold an order for up to 45 days. You will need to place the order over the phone. Please give us a call at 1-800-376-9637, option 1 and a sales rep will assist you. I have a ton of palm trees and I got the chipper for mulching palm fronds along with all the other branches I have. The first day I used it it was great but the second time I used it it took longer to mulch the palm fronds. So I was wondering if the palm fronds dulled the blade. A.Being that the blade is so strong and the fronds are soft, the Chipper will not be dulled by palm fronds. However, if the fronds are wet it can possibly jam the machine up. To fix that, you would need to hose the Chipper down to clear out any wet vegetation. To avoid creating any clogs, you will want to feed the fronds in slower. We have some Palm Lives we cut down every Year, no Body wants them. besides burning, we try to find other ways, we tried to Chip them, but the knifes get doll so fast. Are your Chippers able to handle Palm Lives in a way that i don't have to sharpen the Knifes every 15th branch. A.The road tow kit is very easy to install, it will come with full instructions and we have a tech support team here to answer any questions you may have. Q.How well will the feed chamber accept side branches of dry pine branches up to 5" in diameter?I live in Colorado and these will be the typical branches to chip in my area. A.The base of the Chipper Hopper is approximately 7" x 7". Branches may need to be trimmed. Q.Can this be ordered with the road package already installed? A.Hello, thank you for your question. When ordered together, the road tow package will be installed on the Chipper for you. Please let us know if you have any other questions.